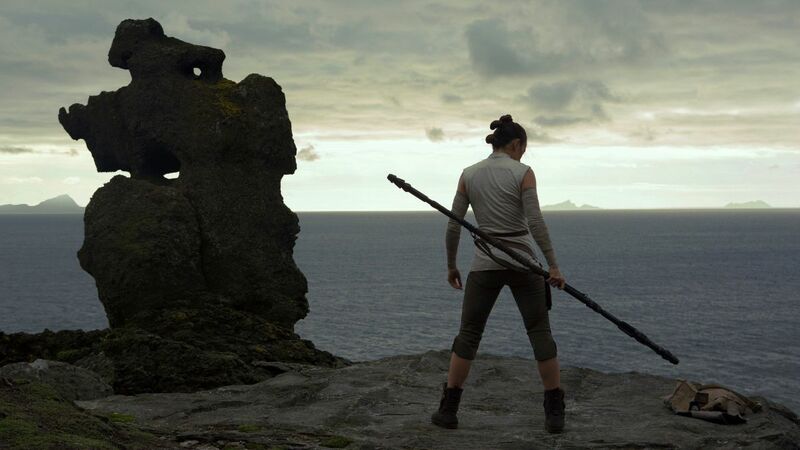 One of the first questions I received regarding my opinion of the latest Star Wars film (after having announced to everyone on my Facebook that I had completed my first two viewings, of course) was whether or not The Last Jedi, the eighth episode of the currently main Skywalker saga of films, was made for casual fans or die-hard fans. I had to think about it a bit, not because I didn’t know the direct answer to that, but because I had to think about the context of the attitudes I’d been witnessing about the movie. It seems as though there’s a very vocal number of fans out there who… well, they didn’t really seem to like The Last Jedi, and they were making sure everyone knew it in the loudest, most entitled, and sometimes even most obnoxious possible way. Could that have been the demographic my friend was implying when he used the term “die-hard?” I never really got a follow-up to my response (I’m still waiting! ), but the fact that I had to consider it at all just made me realize something: I’m kinda tired of so called “die-hard fans” in general. Also, I still think that, after two viewings and nearly non-stop hours of reading about the film and views on it, The Last Jedi is also a pretty great flick, too! The Last Jedi is not a film that will meet a lot of expectations, but – hear me out – that’s not a bad thing. There are those who like to pick apart film formulas and make predictions based on fandom analyses, and on some level, I like doing that too. However, The Last Jedi will especially not please those among us who hold those predictions and tropes so sacrosanct that they believe that the film’s adherence to these apparently essential and largely unspoken laws, as interpreted, are required to be followed in order for the film to be called good or even just a “Star Wars” movie, and any deviation from said interpretation is an aberration unto George Lucas – whose prequel films, they might add, by the way, are apparently also not nearly as bad as you have come to think! 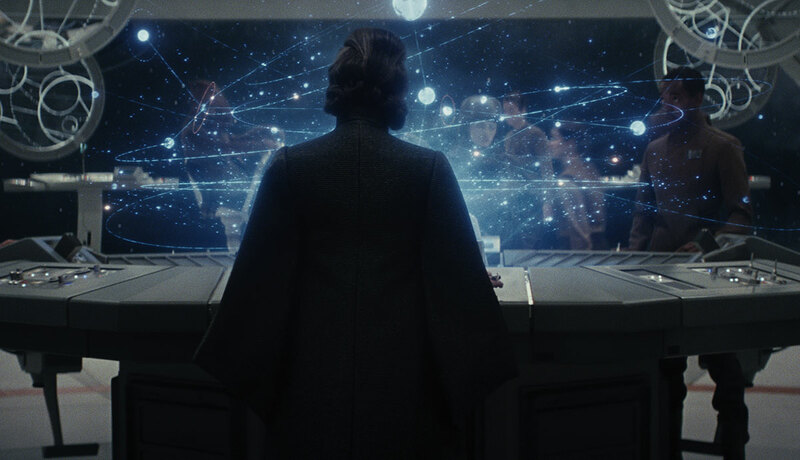 The Last Jedi is a film that demonstrates that it knows the formulas. But it subverts them at several points, right down to the fact that the film is the first in the series to begin pretty much right after the last. The previous movie. The Force Awakens, showed the Resistance fighters destroying the First Order’s Starkiller Base, but only after the destruction of many of the Resistance’s base planets in a demonstration of this Death Star sequel’s power. Crippled and smaller than ever, the Resistance goes on the run, low on resources and increasingly low on personnel, and with the First Order somehow keeping up with the fleet. Meanwhile, as glimpsed at the end of The Force Awakens, Rey has finally reached the Resistance’s seemingly only hope, Luke Skywalker. But it turns out that he is less than thrilled to have visitors, let alone ones who insist upon him confronting his dark past with his nephew and former pupil, Kylo Ren. It’s seemingly up to our new heroes – Rey, Poe, and Finn, along with newcomer engineer Rose – to confront the past, face their insecurities, and even go up against a Dark Side-wielding bad guy or two in order to ensure the survival of the Resistance and themselves in the hopes of taking down the First Order. That’s The Last Jedi in a nutshell, anyway, but the film, as noted before, is far from complacent in how its storyline unfurls compared to previous films in the series. Again, forget what you know about heroes and villains, past and present (well… so far as predictability goes, anyway), and get ready for a film that, even with its scant and obvious parallels to previous entries, will subvert your expectations – almost as if out of spite for all your time spent theorizing how this saga will all go down, some would say. (And, you know, good riddance to bad fan theories!) It does continue the expected trend of the second film being the angsty younger sibling to the more optimistic predecessor, but how it presents itself and the lessons and punishments it metes out to its heroes and villains (and thus audiences, too) is all refreshingly unexpected. Perhaps people in the real world are just taking longer to process this than the characters over the span of the film’s surprisingly narrow time frame. (Despite this being the longest Star Wars film, it actually seems to take place within only a few consecutive days.) Personally, I’ve never been one to believe Star Wars required its clichés to be itself and actually would welcome more deviations from all that from future products within not just this series, but others, too. It’s possible to do that without sacrificing the core spirit of what you’re making, and I’m more than happy to see a film play around and surprise me rather than make a few people feel smart for having figured it all out well ahead of time. And it’s not just the expectation-breaking factor that works here, either. As mentioned before, a lot of the characters undergo a lot of growth in this film, both new and old, and it sets things up for the future in very… interesting and intriguing ways. All of the actors here are still great – Daisy Ridley is charming and captivating as the ever fascinating Rey, Adam Driver is better than he already was as the conflicted Kylo Ren, John Boyega is still amicable and humorous as Finn, Oscar Isaac plays the hero you want to root for as Poe, and even newcomer Kelly Marie Tran as Rose is a welcome addition to the cast as a character you almost never see in these main saga movies: a mere engineer. It is a shame that she and Boyega are relegated to what does feel like a nearly superfluous storyline, but it’s not so much that it’s irrelevant as much as it is that the film has so much epic stuff going on that it doesn’t quite sell the importance of what’s happening in their scenes together in quite the same way it does the conflicts going on with all the other characters. 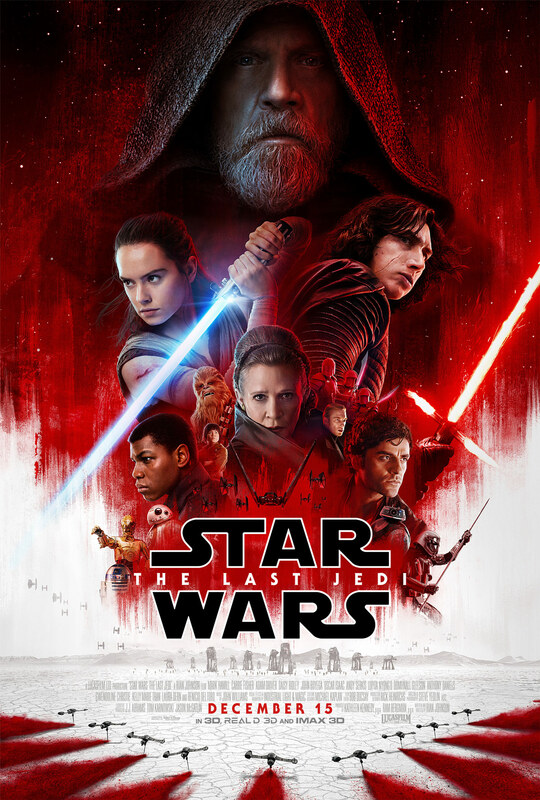 Luckily, it becomes more obvious on the second viewing, and everything else going on – between Rey and Luke, Rey and Kylo Ren, Poe and his new superior officer Admiral Holdo (played magnificently understated by Laura Dern, my favorite new addition to the cast) – more than makes up for any of that storyline’s shortcomings. Carrie Fisher is also wonderful and gets to be a badass as Leia for one last time. But it’s Mark Hamill as Luke, a damaged near-shadow of his former self, who really takes the spotlight in this film. Wiser, but also more jaded than ever after the loss of his new Jedi Order at the hands of his fallen nephew, Luke’s depiction in this film has been the major dividing point between fans, some of whom were perhaps expecting someone who demonstrated his raw power after 30+ years of experience in flashier, more obvious ways. 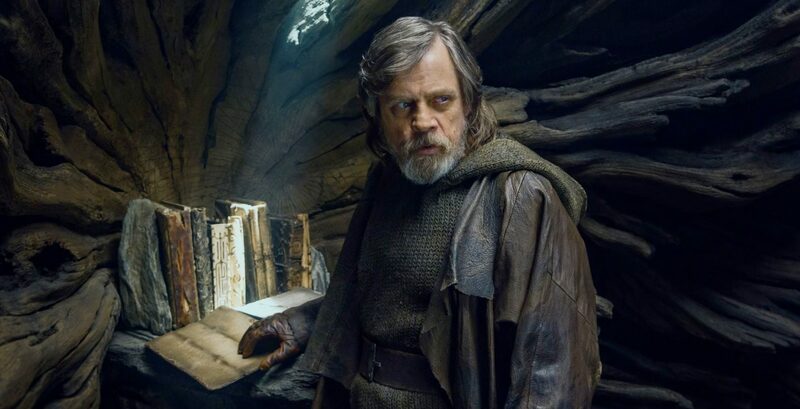 All I can say, without really spoiling anything, is that I think fewer people will be disappointed in his depiction should they not only look at the bigger picture of the Star Wars universe, but also what the implications of everything that happens mean for Luke himself. As with all things in this film, things may not turn out the way you expect or may be wanted, but they do turn out in a way that feels right, and I like the fact that in Luke’s jaded wisdom, he’s still able to show off that power and experience in ways that expand the Force (seriously, he’s awesome in this), while still proving to us all that we also have much to learn, no matter how much we’ve grown. There’s really no telling just what “die-hard fans” of any series want, particularly when they all think they have figured out the way for all this to happen and why. I consider myself to be a die-hard fan – I may not read all the books or comics, but I own multiple copies of the originals, including the DVDs with the original versions, I’ve kept up with both The Clone Wars and Rebels series, and I’ve seen each new Star Wars film since The Phantom Menace multiple times in theatres (no matter how bad they were), even going so far as to ensure I watch the most recent ones first in IMAX 3D (worth it) – and even though I had a lot of ideas for why and how things should turn out, I was also more than pleased to have those expectations upset and subverted, because none of it betrayed what makes up a Star Wars film. It doesn’t destroy childhoods nor does it trash on the original films, and it’s not even petty enough to take shots at the prequels for the audience’s enjoyment. What it does is broaden the scope of Star Wars, break away from expected outcomes we’ve taken for granted, and prove to us that, just as with Luke, we have much more to learn about this universe and how it works (and looks – The Last Jedi is perhaps the most distinctive and beautifully striking-looking entry in the series). I loved this film – yes, perhaps not as much as The Force Awakens, but definitely still way up there. It’s fascinating. It’s beautiful. It’s amusing. It’s epic. It’s action-packed. It’s fresh. And, best of all… it’s freaking Star Wars!